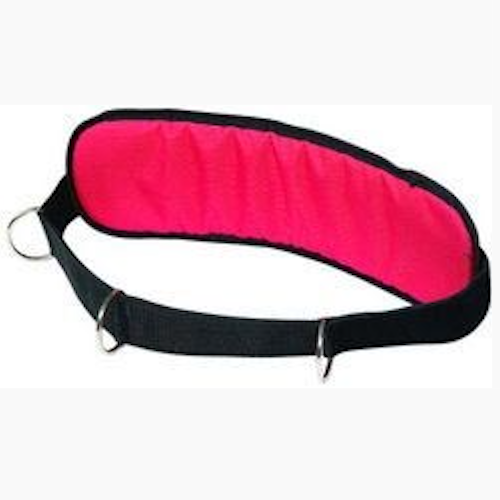 The Predator Belt from Power-Systems is a padded nylon waist belt with a sizable 19" x 6" pad. The size and the thickness of the pad reduces cutting and discomfort during heavy resistance pulls by dispersing the force over a large surface area. The Predator Belt has 3 fixed D-rings that allow you to attach leads to the back or sides so you can perform forward runs, back pedals, lateral shuffles, and other multidirectional drills. The belt will stay secure with an overlapping Velcro closure. The Predator Belt Can be used to exercise and work out with the *Power Harness, *Premium Speed Sled, *Power Sled, *Power Builder, *Speed Harness, or *Leap Frog. Fits up to 48" waist. Competitive Edge Products, Inc. is an authorized distributor of the Predator Belt. 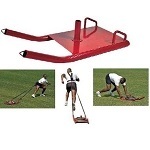 We also carry a large variety of Exercise Equipment. Check it out! *These items not included in purchase. Purchase only includes the Predator Belt Exercise Equipment. Works as advertised. Great for lateral and linear speed/strength building. Very comfortable when running with heavy loads. Works as advertised. On my computer the pic makes the belt look pink. It is red. I purchased this to use as leverage on a high end manual treadmill. Works great! Item was less expensive here than on power systems own web site. My softball team consists of 11 and 12 year olds and they love it. An easy belt to put on and off. Very easy to change drills with having 3 D-rings to connect to. We will be purchasing a couple more. Recommended Seller, but should combine shipping charges on smaller items. Fast Shipping: Orders for the Power Systems 10198 generally leave the warehouse within 1-2 business days. Dimensions: 19" x 6" x 2"